The Iowa Board of Regents is approving the fiscal 2018 budgets for the three state universities. But before doing so, board members heard from the schools’ presidents about how cutbacks in state support are hampering their efforts to stay competitive. At Iowa State, faculty and staff salaries are frozen. At UNI, some adjunct faculty have been let go. Regent President Michael Richards says each school has its own challenges. “I think we’re open to looking at what each university needs to move forward and keep progressing,” he says. 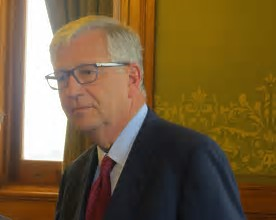 Richards says the Regents will continue to make the case to the Legislature and Governor’s office Iowa’s universities need strong financial support from the state. The University of Iowa is operating on $7 million less in state funding than it received 20 years ago.